Roger Baldwin is considered to be the father and inventor of card counting. This role sometimes is wrongfully given to Edward O. Thorp but it is not true. Thorp was actually the follower of Roger Baldwin and he developed the system which Baldwin invented and proposed to use while playing blackjack. The memorable year for card counting was 1956. This is the year when Roger Baldwin published his famous work in the Journal of the American Statistical Association. This paper was the first which described how it was possible to use the math theory in the game of blackjack. The paper name was The Optimum Strategy in Blackjack and it consisted from different mathematical calculations, statistics and so on which could help you to win. 1957 was also a very productive year for Roger Baldwin as an author as he wrote a book called Playing Blackjack to Win and he made it with two more authors (Wilbert E Cantey and Herbert Maisel). This was a unique book and it described all winning strategies of playing blackjack. 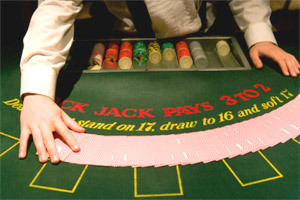 Playing Blackjack to Win was republished again in 2008 and was sold to more than 20 countries all over the world. For this book Baldwin and his co-authors were honored and became members of well-known Blackjack Hall of Fame. This Hall is located in San Diego, California and it has been honoring blackjack experts and other people who had an influence at blackjack studies since 2002. And though the book which gave Roger Baldwin a right to become a member of Blackjack Hall of Fame was written in 1957, only its republishing of 2008 brought an honor to come to this Hall. Playing Blackjack to Win was first written by Baldwin, Cantey and Maisel during their time in the US army. It was the first blackjack basic strategy where only mental calculations (without any electronic machines) were described to use for winning.